Trees and plants are a beautiful and vital part of landscaping around homes, businesses, other buildings, and places like parks and greenways. Not only do they add beauty, they are also beneficial due to the fact they absorb carbon dioxide and give off oxygen. They help to hold topsoil in place when it rains or is windy. They provide shade, a home for birds and certain animals, and some trees produce fruit and nuts for people and animals to consume. If a landowner plans for construction or remodeling on his or her property, or other activity in the neighborhood such as road construction or utility work takes place, here are some pointers for protecting the trees on the property from potential damage or death. One important thing to do is to contact a local professional urban forester or arborist. This person is educated in the local trees and will know and understand the problems trees in a particular area may face. They will know their growth characteristics, quality maintenance measures and care in the event of damage. The arborist will be able to help with pointers on protecting trees from construction damage. For your own protection, hire a professional who is part of an established business and is listed in the phone book. Ask for references and be sure they carry insurance, such as property damage, personal liability, and workers compensation. Some damage done to trees during construction is obvious, such as broken branches or chunks of bark peeled off. Other damage may not be visible or immediately noticed. Root damage can occur when digging is done, such as for laying underground utilities, irrigation lines, or foundations. The roots are the most vital part of the tree, as they absorb water and nutrients from the soil, store energy, and anchor the tree to the ground. Therefore, it is important to know where the roots are and how to protect them from damage. Damage to the root system of trees can occur very easily. The Protected Root Zone (PRZ) is often considered to be the area beneath the outside circumference of the tree limbs. However, roots can extend as far as two or three times the height of the tree. 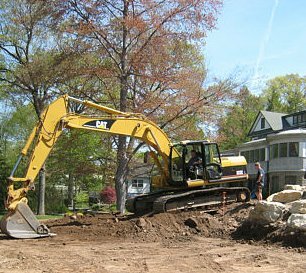 Just simply driving a large dump truck, backhoe, or other heavy equipment over the ground can crush sensitive tree roots underneath. Ninety percent of a treeâ€™s root system lies just three feet underground, while 50 percent lies just one foot down. It can sometimes take years for the damage to reveal itself in the tree. By that time, the landowner has no idea what has caused the treeâ€™s problems. Of course, damage occurs in other ways and places, too. A truck may drive too close, scraping the bark or breaking limbs. Building materials may be accidentally dropped on or against a tree causing damage. Surface wounds to the tree may be treated, but if left untreated can become an entry point for fungi that will result in later decay. Broken branches should be trimmed back to the proper place. There are few remedies for severed roots. A tree can usually sustain a loss of 20 percent of its root system and still survive. If it loses 40 percent, it will die. Then the tree will need to be removed so it doesnâ€™t become a hazard. If digging must be done where there are tree roots, do everything possible to protect them. If they must be cut, a clean cut will heal better than a ragged cut. Otherwise, fence off the area around each tree, reroute truck traffic away from the tree as much as possible, and store materials away from the tree. Remove all undergrowth and debris from under the tree to assure healthy roots. Decaying organic matter can create noxious gases that harm a treeâ€™s roots. Tree roots can also be smothered. Increasing the depth of soil around a tree will prevent the tree from obtaining necessary oxygen. It can also decrease the supply of water. Even a temporary dirt pile or water puddle under a tree can cause damage. Trucks driving over and over the same ground close to a tree can compress the dirt so tight that the roots canâ€™t obtain nutrients, water, and oxygen. Even one or two passes by a heavy truck can compact the dirt and lead to tree damage. Tree roots can also be poisoned by chemical spills. Fill gas or diesel tanks, clean paintbrushes, or do any equipment repair away from tree roots. Never rinse a cement truck or mixer near a treeâ€™s root system. Water trees heavily before and during the construction time period, especially in hot, dry regions. This will help to preserve the health of the tree. The landowner, when planning construction, will first assess the trees on the property and determine which, if any, trees are expendable, and which trees must be protected. In a region where there are few trees, it is important to save the trees if at all possible. In an area where trees are plentiful, some may be sacrificed in favor of the building. The health, life expectancy, and productivity of the tree should be taken into consideration. An old tree that may already be damaged may be considered not worth the cost of saving it. On the other hand, a young, healthy tree may be worth the expense. Fruit and nut trees should be given special consideration for the benefits they bring. To prevent damage to protected trees is expensive, but less expensive that having to remove a dead tree and then replace it. It is also cheaper than to have to treat a sick or damaged tree until it recovers. When a construction project is planned and well thought out, the trees on the property will also be considered and planned for. This will ensure many years of enjoyment of the new construction including beautiful trees.